I tried an interesting experiment this week within my various Professional Learning Communities. 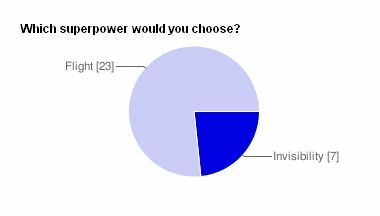 Inspired by a fascinating radio piece by John Hodgeman on This American Life about superheroes, I asked folks a fairly simple question: If you could have the power of flight or invisibility, which would you choose and what would you do with that power? If you look at the graph above, you’ll see that most of the 30 respondents chose flight over invisibility. Hodgeman also found that a lot of folks chose flight (he went into bars and other social places to ask his question). Hodgeman observed that, unlike the superheroes of comic books, most of the people he surveyed would not necessarily always use their powers for the good of the world, but instead, they would use it for themselves and family. I found some of the same in my survey. A few folks would fly to warmer climates (or, as one person put it: “I would get the hell out of the cold!”); or avoid airports for traveling the world (“Flight would make transportation easier and help me with time management as it would not take as long to get places!”; or save on some carbon fuels (I guess that is saving the world, right?). Another interesting thing that Hodgeman found was that invisibility seemed to be chosen by people who see themselves more as introverts, who want to slip away unseen and be part of the background, while those choosing flight seem to be extroverts, impressing the world with their powers. Pretty fascinating. I would fade away at certain moments and then hear what the world says when I am not listening. I would like to invisibly be where I should not be, hear what is not meant for my ears, see what is not meant for my eyes. I would slip silently through the darkness, and blend in with the night. I would sit in stillness in the woods. I would disappear when a chronic complainer was seeking me out. I would be a fly on the wall and listen to interesting conversations without feeling the need to but in. I would hide in plain sight. I would stand behind someone who needed the comfort of just knowing I was there. I would spy and steal things gather information and sell it. Among other things, I would “hide” when I got into a little trouble. Also I have to admit, I always thought it would be cool to be a spy and what better power to have for that job. I choose flight: fly, float, sail, soar. With that power I’d have the bird’s eye perspective, the really big picture, the true world view. Swoosh. I would like the freedom that flight would give me. I could go wherever I wanted and get a bigger picture of my world. I could even fly back to the Caribbean to watch the sunset. Being invisible would bring me in closer to people, add stress to my life, and show me things I’d rather not see or know. This would be my Star Trek Transporter. I could officially add the words “Beam me up” to my vocabulary and head anywhere I wish…and do so quickly. No more gas-guzzling vehicles, no more airport security or delayed flights. I would use my flight superpower for personal endeavors…and to save the random child falling from a tree or get down the cat stuck in it. I am going to go with flying since my life would be markedly better if I could get places faster. But my true secret desire is to be invisible–that superpower just fits my personality better. I am very loud and easily excitable and would like the ability to slip in and out of places unnoticed. I would fly. I know that sounds simple, but just imagine being able to do in real life what we occasionally get to do in our dream. In flight, I would be free. Invisible, I think I would be bound more than ever before. I’m sure I’d be able to have more power over others with invisibility, but in the end I think flying would be more personally fun, which is more my thing. What would I do with my flight power? Why, I’d fly, silly! Go on grand adventures, sometimes on my own and sometimes with my pet chickens (tucked under my arms and on my shoulder) as the poor darlings can hardly get airborne on their own. Life would be easier and more exciting! Thanks to everyone who participated. I guess I will leave the survey open for anyone else who wants to join in. You can find it by going here.